What’s happening to Talking-up Scotland? Scale: August 16 to September 14. I wonder, does BBC Scotland have anything to do with this boom? So, good news is liked by many, I’m told, but BBCbaaad is the thing!? Previous Article Is BBC Scotland on a sickly roll as one [genuinely] very sad story is clearly enough for their ‘journalists’ to scare the anxious voter in early morning Scotland? “They deem him their worst enemy who tells them the truth”—Plato. BBC Scotland is probably not its own master, but give them enough red faces and people will start to notice. As your “views” show. So, keep it up John and, hopefully we will get an honest broadcaster in time. People just like getting the truth, most people are sick to the back teeth of this anti-independence SNP/bad garbage that the BBC are spouting. It really is sewer journalism. And we pay a TV license fee for this manure. I heard a bit of an interview on GMS (whilst driving – so couldn’t give full attention) this a.m. with (I believe) a gent who is the Vice Pres. of NFU Scotland (sorry – didn’t catch jhis name) – He was scrupulously polite but taking no prisoners. He described some footage in the docu-drama as having been taken in (I think) Eastern Europe at some point. He described that using this footage and implying it involved current Scottish calves being exported to Ireland or Europe equalled “..fraud..” – The interview was (very) hurriedly ended. Meanwhile, I heard a single mention on GMS (yesterday) of Scotland’s Chief Vet describing the beeb’s (soon to be award winning I’m sure) docu-drama as “alarmist”. 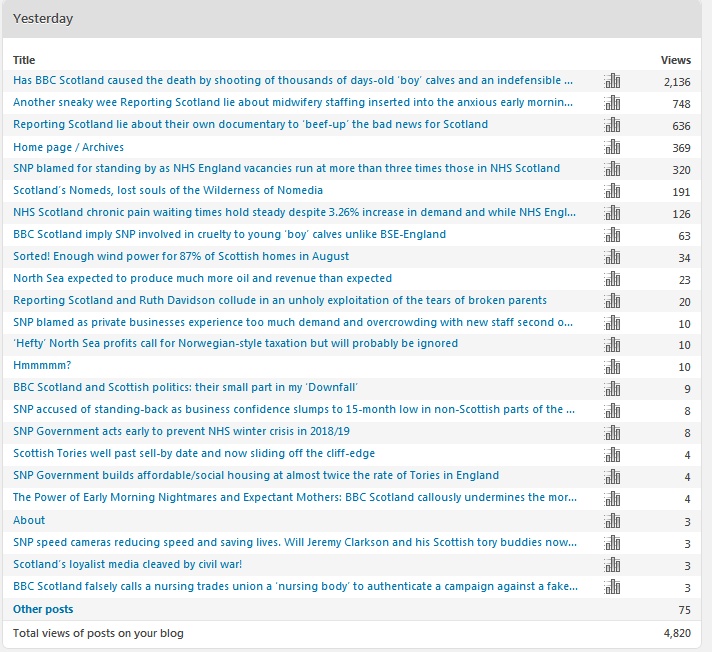 I tried to find this info on the beeb Scotland website – but was unsuccessful. NOTE: Scotland’s Chief Vet Sheila Voas was appointed as an advisor back in 2004 (ie – back in the days of the Lab/Lib executive). So the Better Together media can’t depict this long-standing and highly respected public servant as an SNP Baaad place-person. Writing in The Times, Ms Voas said much of the commentary around the practice “could be politely referred to as alarmist”. The Scottish Government is currently undertaking a year’s worth of research to determine the effects on the calves of these journeys. She added: “There are a small numbers of calves being transported to Spain for fattening and production. These are male dairy calves which otherwise would have no productive purpose in Scotland. Ms Voas said she had recently travelled to Catalonia to see a consignment of calves arrive, saying the animals were “bright and alert” when they were unloaded. She added that while “typically the overall journey to Spain takes about 100 hours” the calves spend “more than half of this time resting or being fed, unloaded off their transport, at control posts”. Dumfries and Galloway Pensioners for Independence are lobbying the UK government after BBC chief Tony Hall proposed to scrap the current licence fee exemption for over 75s.